Groups working on the Design with Purpose course will research, brainstorm, prototype, and share their own technology innovation. 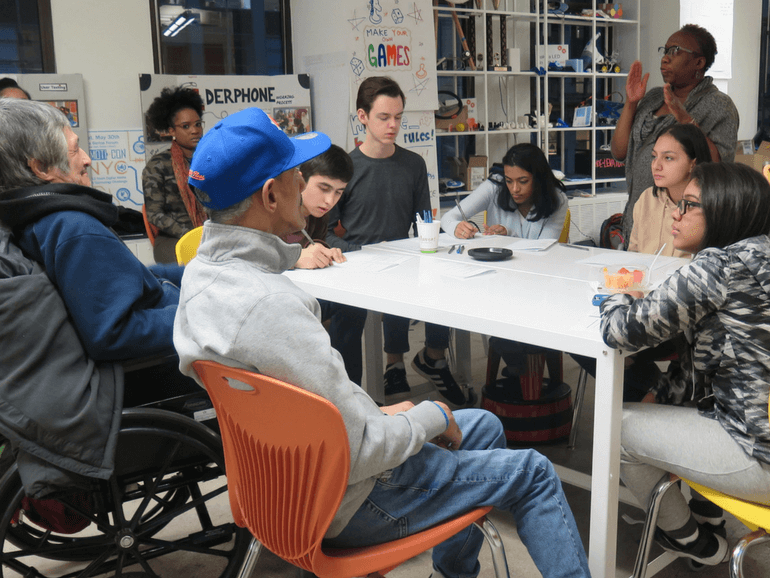 By practicing and applying the Human-Centered Design process, youth will learn to empathize with their users and design technologies that address an authentic need. Design is Everywhere: Explore the world through the designer's lens. Learn the fundamentals of design and determine what makes design more or less successful. 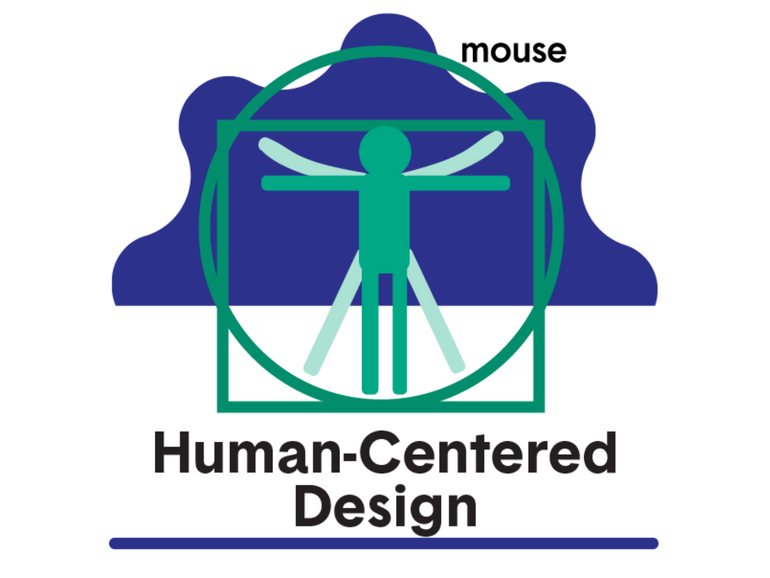 Human-Centered Design: Discover how professional design teams come up with innovative ideas that are inspired by real people with real needs. Design a Better World: Make hundreds of sandwiches in 30 minutes with lots of ridiculous rules to bring teams together around a common and fun goal. 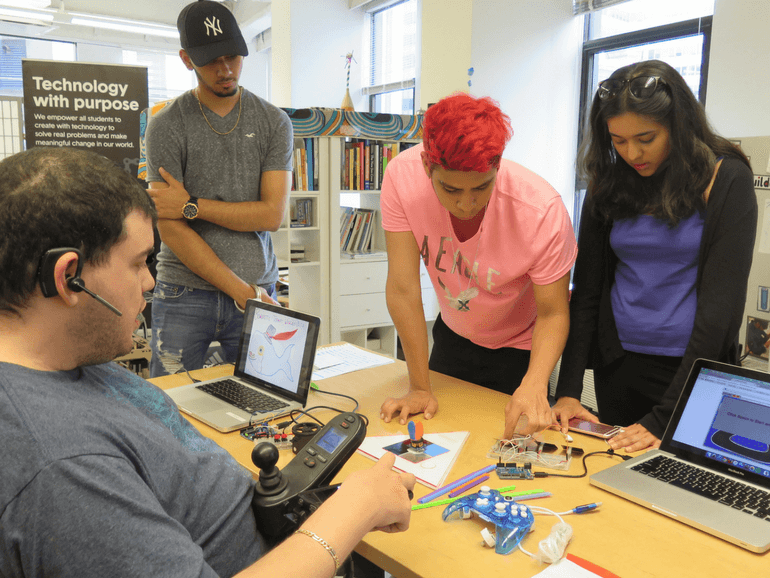 Empathy and Assistive Tech: Experience through simulations how empathy makes it possible to design things for other people. Interviewer Strategies: Practice different interview techniques with a partner and learn how Human-Centered Designers uncover the needs of their users. Design Observations: Spot opportunities for design everywhere you look by sharpening your observation skills! 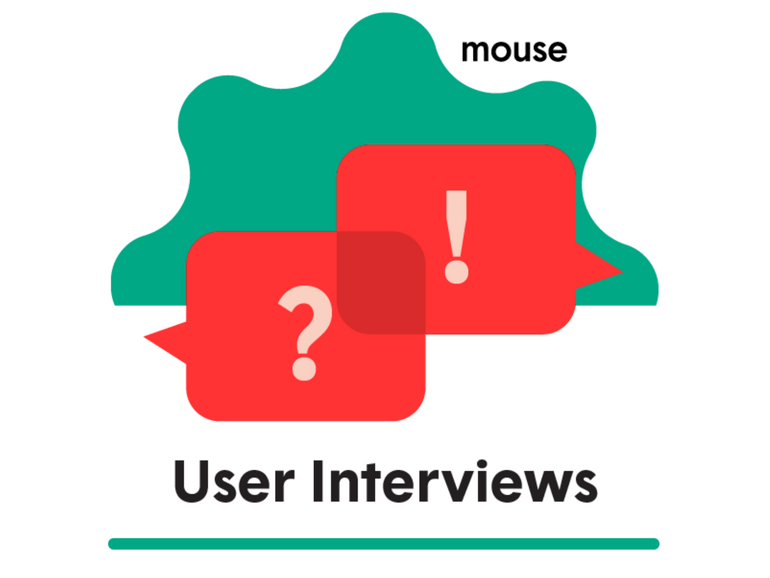 Interviews with Target Users: Lead interviews with target users in their own environment, taking observations and notes to find design opportunities. Synthesizing Interviews: Organize your interview notes to find themes that will guide you through brainstorming good ideas. User Personas: Create a detailed profile called a User Persona to help you come up with ideas that address a group's needs, life experience and motivations. Framing Questions: Learn how to frame your design challenges with How Might We Questions in order to achieve the most from brainstorms. 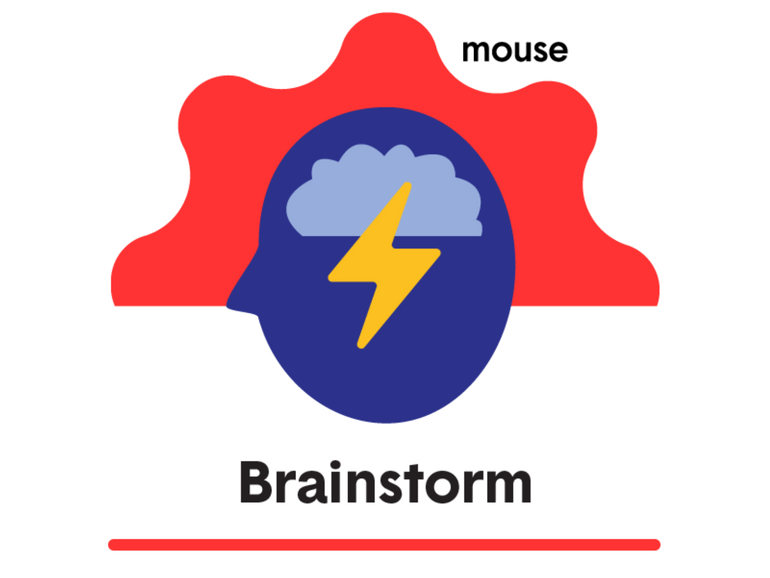 Rules of Brainstorming: Practice the professional process of brainstorming once your research and problem identification are complete. 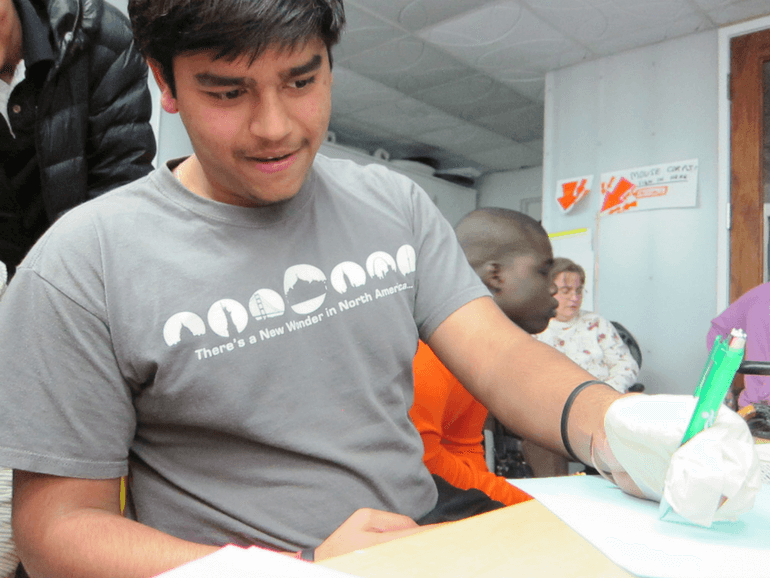 Design in a Bag: Turn a design challenge and bag of random items into a rapid prototype. Paper Prototyping: Experiment with paper prototyping by reverse-engineering everyday objects to get a glimpse into how they were designed. Playtesting: Learn the key design skill of playtesting from designing a quick 'race-to-the-end' game with a partner. Iterations & Feedback: Create and document 3 increasingly technical iterations of a design prototype incorporating feedback from users. Design Story: Engage audiences in your project by telling a strong design story featuring great documentation. 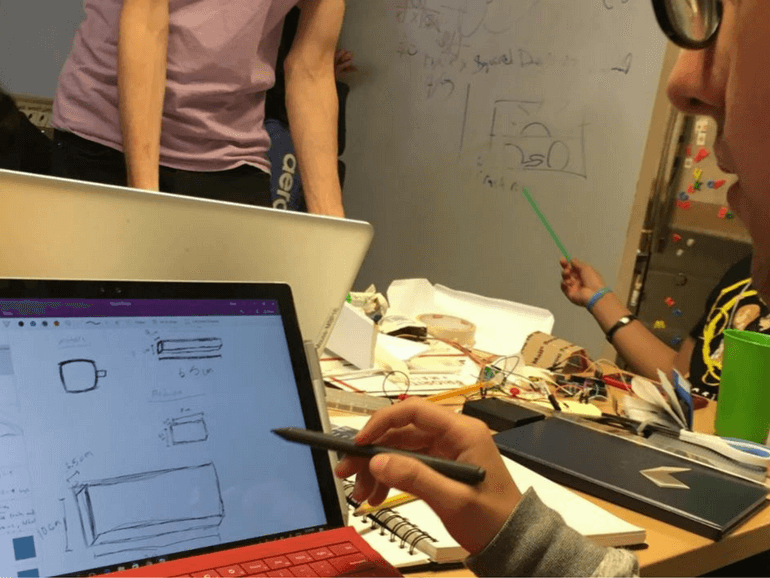 Design a Mobile App: Explore how mobile apps are designed with the sensors and hardware that give them special powers, critique your favorite apps and then design one of your own! Intro to the Arduino: Create and program a digital blinking LED light circuit with the Arduino Microcontroller. 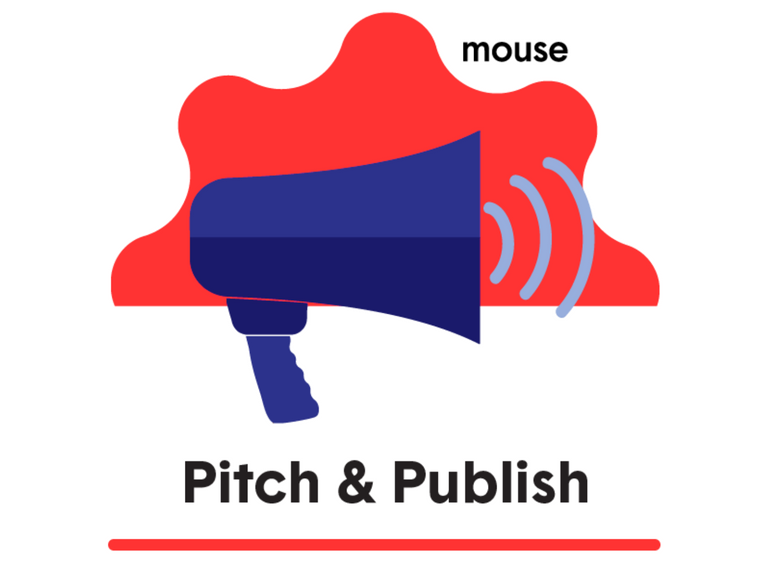 Make a Simple Website with Thimble: Make a simple and publish a simple website with Mozilla's Thimble tool. Model Something Real in CAD: Level-up your CAD software skills by modeling real-world objects in the digital realm. Secret Sculpture: Practicing Communication: Boost your communication skills with a team sculpture challenge. Telling the Story of Your Success: Develop skills and habits that make documenting and demonstrating work part of the creative process. 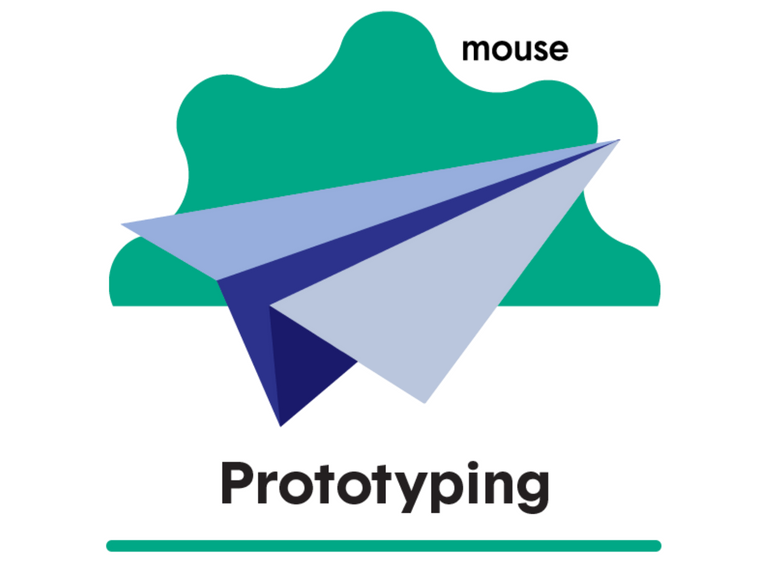 Mouse Design League is a design and technology program in which members create inventions to make a positive impact on the lives of others. 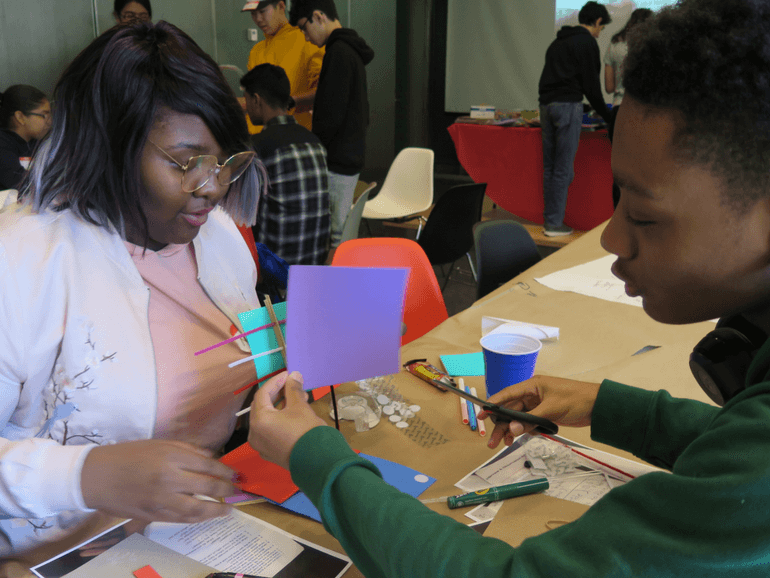 Design League members develop creativity, problem solving, and collaboration skills, and build confidence in designing technology with purpose.